Naguru/Bukoto are adjacent neighborhoods which we’re combining into one review because they’re so small and close. Naguru/Bukoto is a quiet, understated, upscale area on the outskirts of Kampala. It’s a bit removed from the action, but covered in lush gardens and is just separated from all of the conveniences of posh Kololo by the Lugogo bypass. With new apartments popping up in Naguru every month, it’s a great area to find a quiet, high-end place to stay. Furnished apartments generally cost between $750-$2500 per month. Houses in Naguru run for around $2,000-$5,000 per month. Most of the houses are gated and secluded, they vary in size and shape but there are some beautiful mansions dotting the area, especially at the top of the hill. Naguru is easy to navigate with paved roads and good infrastructure. It has a peaceful quality and many of the residential streets are lined with tall, beautiful palm trees. 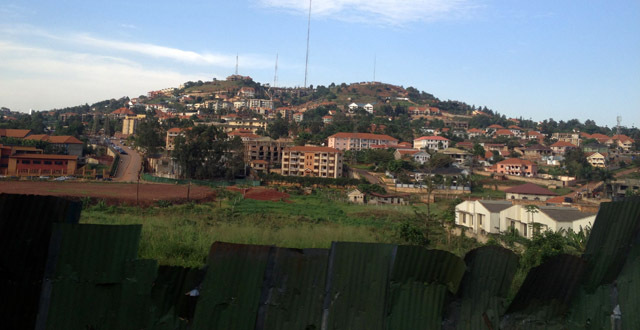 Kampala international school (KISU), located in Bukoto, is accessible to both neighborhoods. KISU offers quality education and tons of extra-curricular activities. Bukoto offers renters more budget options than Naguru, but maintains a similar quiet, safe environment. Furnished apartments range from around $400-$1,500 per month. The houses are generally a bit smaller than those in Naguru but are usually quality homes and cost around $1,000-$2,500 per month. Elgon Courts – Fully furnished, pretty typical Ugandan styling, balconies with beautiful views. Facilities include a gym, sauna and steam bath, wifi and laundry services. Call for rooms and rates. Bukoto Brown Flats/ Bukoto White Flats – Government owned housing built in the 1960’s. Nice, corporate class apartments, a comfortable place to stay. White Flats have 2-3 bedrooms while Brown are a bit smaller and less expensive. Cwezi Suites – Fully furnished, 24 hour security, laundry facilities. Quality kitchens. Single rooms are $70 per night or $1200 per month. Double rooms are $120 per night or $1500 per month. Castle Apartments – Fully furnished apartments near the northern bypass in a quiet area. Prices range from $1,700-$2,400 per month. Hotels in Naguru/Bukoto offer quiet, serene accommodation. It’s kind of a cool change form a lot of the commercial hotels in town. There are great budget prices, amongst the smaller hotels, and more high-end accommodations at the Kabira Country Club. Capitol Palace Hotel – A boutique hotel with 22 rooms and a restaurant. The hotel is beautiful with earthy, well thought out aesthetic choices. The staff is friendly and accommodating, the grounds are beautiful and the food is delicious! Forest Cottages – Quaint cottages nestled amongst beautiful plants and huge shady trees. A self-proclaimed wild life sanctuary with flowers and indigenous plants, locally made furniture! Equipped with internet, television and a pool. A small restaurant that serves Asian and African cuisine. Hostel rooms available for $40 a night. Cottages range from $80-$200 per night. Kabira Country Club – The hotel is clean and nice, somewhat noisy because it’s on the main road. You can find similar, often more high-end accommodation in town for equitable prices, so some people argue that it’s not worth the money. But if you’re planning an extended stay of bringing your family, then the facilities might make it worth the money. Facilities include: fitness facilities, a great pool, tennis and basketball courts, racquetball, a soccer field, a good restaurant/bar and cafe. Prices range from $145-$250 per night. There are also short and long term accommodations available at Kabira. Cottages range from $120-250 per night and $1800-$3200 per month. Nob View Hotel – In Bukoto, walking distance from Kabira country club. Simple, budget rooms. Clean spaces with hot water and balconies with a view over quiet, residential area. Good breakfast and a big pool. Good service, wifi available in common area. Cheap laundry services. There isn’t extensive shopping available in Bukoto/Naguru but Nakumatt grocery in Bukoto is a wonderfully convenient staple. Nakumatt carries groceries, household goods, electronics and beauty products. If there is something more obscure that you’re looking for in Kampala, or something imported, you’re likely to find it at Forest or Lugogo Malls, just past the Lugogo bypass, a five minute drive away. At Lugogo Mall, Game (owned by Walmart) and Shoprite are both extensive, quality supermarkets.There is also a Good African Coffee shop and a Banana Boat which sells handmade African crafts and souvenirs. You can find a lot of similar crafts, for much cheaper prices, at the craft markets. But it’s worth looking in Banana boat because they have done all of the work for you, filtering out only the best pieces, and have some one of a kind gems. Nakumatt – In Bukoto. Nakumatt carries groceries, household goods, electronics and beauty products. Game/Shoprite – Adjacent South African grocery stores that have almost everything. If you can’t find something at one, it’s probably at the other. Banana Boat – African crafts, arts, souvenirs and gifts. Biplous Supermarket – In Bukoto, smaller supermarket with groceries and household goods. Kenjoy Shopping Centre – In Bukoto, smaller more affordable supermarket! Bukoto/Naguru has more to offer during the day with lots of facilities at Kabira Country Club, fun lunch destinations and the Afriart Gallery. Afriart Gallery – Open Mon – Sat, 9am to 6pm, showcases cool exhibits from both local and global artists. Check online to stay updated for new exhibits, and events. Cool grounds and gift-shop. Kabira Country Club – A great place for families with lots of facilities including: gym, squash courts, swimming pools, tennis courts, basketball court, Jacuzzis and saunas. Activities range from fitness classes (Yoga, Pilates, Body Pump and Spin) to massages, facials, exfoliation treatments. There is also a bar, restaurant, cafe and lounge areas where you can spend the day relaxing or comfortably working. Full membership costs 1,200$ per year. Cayenne Restaurant and Lounge – Pool, salon and spa, delicious lunch. Restaurants in the area specialize in local food and quick eats. Kembabazi Catering Centre – Famous for delicious, well-executed local dishes like boiled meats, veggies, potatoes, cassava, matooke, millet etc. If you want to eat like a Buganda, this is the place! Kabira Country Club – Restaurant, full bar and coffee shop. Indian and Ugandan cuisine. Mongolian Barbecue every friday evening. The food is good but nothing to write home about, nice, relaxing atmosphere. Nakumatt – A great place to grab a fast lunch, you can buy really great sandwiches at quality cuts inside Nakumatt for $4. Taste Budz – good, small pizzas, good indian food. Cayenne Restaurant and Lounge – Seasonal, local ingredients, really good pizza, a wide-variety of yummy Pan Asian dishes, a small herb garden that supplies fresh mojitos! Kabira Country Club – A nice, quiet coffee shop. Good African Coffee Cafe & Restaurant – Indoor and terrace seating, wifi, located at the Lugogo Mall. Convenient place to grab a good lunch or an afternoon coffee. Naguru/Bukoto doesn’t have much nightlife, which helps to maintain the area’s signature peace and quiet. Cayenne night club is the only nightlife destination for those who don’t live in the area. Cayenne Restaurant and Lounge – Located in Bukoto, good food, famously good pizza. Pizzas are two for one on Tuesdays! Fun club atmosphere that gets crowded late on friday and saturday nights. If you’re planning to dine at Cayenne it’s best to go early or during the day to avoid the loud music, and to enjoy the poolside outdoor seating. If you’re planning to party it’s best to go late to avoid an awkwardly empty room. Alfredo’s Bar and Lodge – Events like Poetry and hip-hop nights, ladies night (on Thursdays), and dance parties on the weekends. This place is cool about half of the time. Your likelihood of having a good time goes up if you bring a big group to make your own fun. Kabira Country Club – Has a bar and is a great place to chill and watch sports games. For healthcare in Bukoto/Naguru I would recommend The Surgery in Kololo, just a 10 minute drive away. The Surgery is a small hospital that offers excellent personal care, affordable insurance and expert Doctors. It is open 24 hours a day. Bukoto Fertility Clinic – Successfully facilitated the first case of surrogacy in Uganda. Kadic Hospital Bukoto Kampala – A 24 hour hospital which offers inpatient care. Kaserena Children’s Clinic – Pediatric hospital located along Ntinda-Bukoto road with five pediatricians on staff. Naguru General Hospital – A 200 bed public hospital with a maternity ward, pediatric unit, blood bank, an adolescent health center, and radiology department. I am looking for a 2 bedroomed furnished apartment in a good area. Any pointers? What is the number to call for Elgon? Hi Jessica – thought you should check out the new local ‘coffee hub’ in Naguru. Opposite the new Surgery is a little place ‘Down2Ice’ – really nice and good cuppacino’s. Menu is good and service is friendly – just dont be in too much of a rush., but then again – the have cold wine, which makes up for the waiting period. its the same owner from Colours of the Wild and they really try and make one feel welcome and cater to your needs. thanks for this wonderful guide. My first time to check it out and i will keep in touch. Thanks for the pointers about “Down2Ice”. I’m one of the writers for the site and also live near Naguru, so I’ll be sure to check it out. I’m moving to Kampala and am looking for any information on life there in general. My major concern is – is it safe for foreigners especially women?